Some things never get old. Remembering wonderful things that came our way out of the blue always brings a smile. For sheer joy, it’s a toss-up between that and remembering the most outlandish, hilarious misfortunes that happened to those whom we might consider our enemies. Three defining moments of Oregon Football 2014 are the subjects of this week’s Three-and-Out, and two of them have that delicious combination of gifts from above for Ducks and pie-in-the-face for the Ducks’ foes. 1. The Jameis Winston Fumble. On a scale of one to ten, this had to hit triple digits in gratification for any Duck fan. It unfolded in the fashion of a movie, where in the end the bad guy just plain did it to himself — with just enough help from the hero. With under two minutes left in the third quarter and Oregon up on Florida State 39-20, a Florida State touchdown would have brought it to under a two-touchdown lead going into the fourth quarter. And knowing Winston’s history of comeback wins, Seminoles fans were smelling blood when Winston led the bad guys from their own 23 to the Oregon 30 in six plays following an Oregon score. Facing third and five, Winston’s pass fell incomplete, setting up a “gotta-go-for-it” fourth down, considering score, time remaining and field position. Back to pass, Winston scrambled away from pressure only to see Oregon’s Tony Washington bearing down on him like a freight train. He balked, freaked, fumbled and planted on his posterior, all in one beautiful motion mimicked by the official trailing the play. Washington scooped up the ball, and seconds later it was 45-20 Oregon. It was a complete moment. Washington was totally redeemed from the incident in the first Arizona game involving a bit of minor celebration that gave an official the excuse to give the Wildcats a fresh set of downs — which led to the game-winning touchdown. Winston dragged himself to the Seminoles sideline and got a blast of profanity from Jimbo Fisher, complete with expletives not deleted. And Oregon won the hearts of the nation. The 29-game winning streak for the forces of evil was ended, and for the moment pretty much everybody in the college football world was a Ducks fan. Chances are that the win over Florida State — and the happy-happy feel-good movie way that it happened — will pay heavy Duck dividends over the next few years on the recruiting trails. Lost in all of the celebration, though, is what a great job the Oregon coaching staff did in teaching discipline to the Oregon players. It became obvious that the Ducks knew two things that the Seminoles didn’t: how to hang onto the ball and how to take the ball away. In short: discipline. 2. The Fourteen-Point Utah Swing. I confess. I really like Utah’s fight song. It’s so fun, happy and bouncy. And their fans are so enthusiastic. So it was such a precious moment of joy to listen to Utah’s fight song and see their happy fans high-fiving and jumping up and down — while Oregon was scoring a touchdown. It still warms my heart. In the first play of the second quarter with Utah already up 7-0, the Utes’ Kaelin Clay had apparently scored on a 78-yard bomb. Unfortunately for Clay, the Utes, their marching band and their fans, he dropped the ball a yard short of the goal line. So while the Utes celebrated what they thought was a Utah touchdown, Oregon linebacker Joe Walker scooped up the loose ball, and with a convoy of Ducks out in front ran a hundred yards the other way for a Duck touchdown. A rare moment indeed: Touchdown celebrations were going on in both end zones — but it was only in the one occupied by Ducks that the official had both arms in the air faster than you could say “French foreign exchange student.” In case you missed it, here’s the cartoon edition of the event. While it was all great fun (for Ducks fans, not so much so for Utah fans), what is most overlooked — again — is the discipline of the Oregon players. One Utah player had the presence of mind to slap the ball to the ground in the Oregon end zone before Walker picked it up to make his marathon dash the length of the field. And one Utah player tried to tackle Walker along the way. Since Walker had six Ducks’ blockers in front of him, the would-be Utah tackler didn’t stand a chance. But do the math — that’s seven Oregon players who had the presence of mind to join in the play to only two for Utah. That says something about the coaching. 3. Stanford Game Third Quarter. 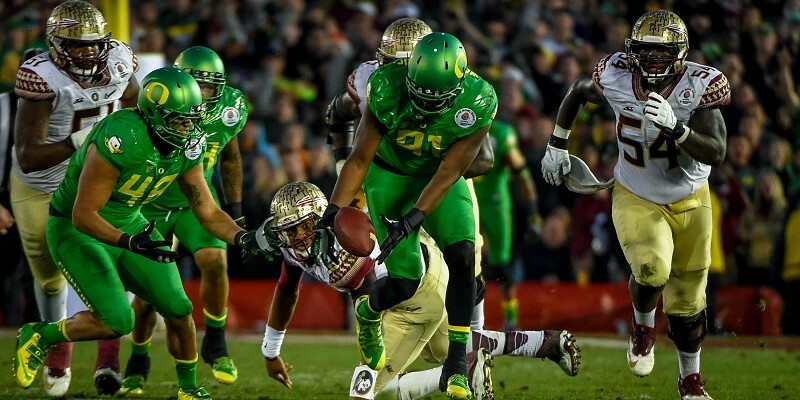 It didn’t have the flair of Jameis Winston playing deer to Tony Washington’s headlights. It wasn’t fun like Joe Walker’s 100-yard fumble return. But what happened in the third quarter of the Oregon-Stanford game brought every bit as much cause to celebrate for Ducks fans. Oregon dominated the first half, but led only 24-13 — and Stanford had the ball to open the second half. A Cardinal touchdown would reduce Oregon’s lead to four. It looked possible, with Stanford grinding out eight plays in 4:45 to move to Oregon’s 32. But on first down, the Cardinal went for broke and Erik Dargan intercepted the pass at the UO one yard line. The Ducks moved the ball out to their own 33, burning only 1:55 before Marcus Mariota threw a rare interception, setting Stanford up on its own 40. The Cardinal consumed another 5:50 of the clock driving to the Oregon eight yard line, but had to settle for a field goal. At that point, Stanford had controlled the third quarter clock for 10:25 to Oregon’s 1:55, with virtually the entire quarter being played on Oregon’s defensive side of the field. And Stanford had 91 yards of total offense during the quarter while holding the Ducks to a meager 32. But the Color-not-the-bird had only 3 points to show for it. 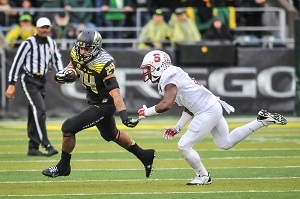 Thomas Tyners 21-yard 3rd quarter TD run against Stanford was a defining moment for the 2014 Ducks. Then the dam broke. In typical Oregon fashion — and ignoring the Stanford Syndrome of the past two years — the Ducks went eight plays, 75 yards in 2:27, with Thomas Tyner hoofing it in on a 21-yard run. Stanford won the third quarter clock, 10:28 to 4:32, but lost the scoreboard, 7-3 and Oregon was on its way to a 45-16 win against one of the top defensive teams in the country. The common elements of the three games is that the Ducks were focused and opportunistic, demonstrating all the signs of a well-coached team. In 2013 Mark Helfrich was successor coach to Chip Kelly’s team. In 2014 Helfrich — despite some mid-season doubters — came into his own, and his team demonstrated it in nationally entertaining fashion.